Yes, it sure is. But some people think that as long as it posted on internet it is free for all to use. I see this on facebook also, some open sites has hundreds of photos from Shipspotting without mentioning source. Rather sad this excellent picture was illegaly posted at Instagram within days by the criminal mentioned in the forum many times. My grandparents took many cruises on Hamburg and her sister ship Hanseatic. 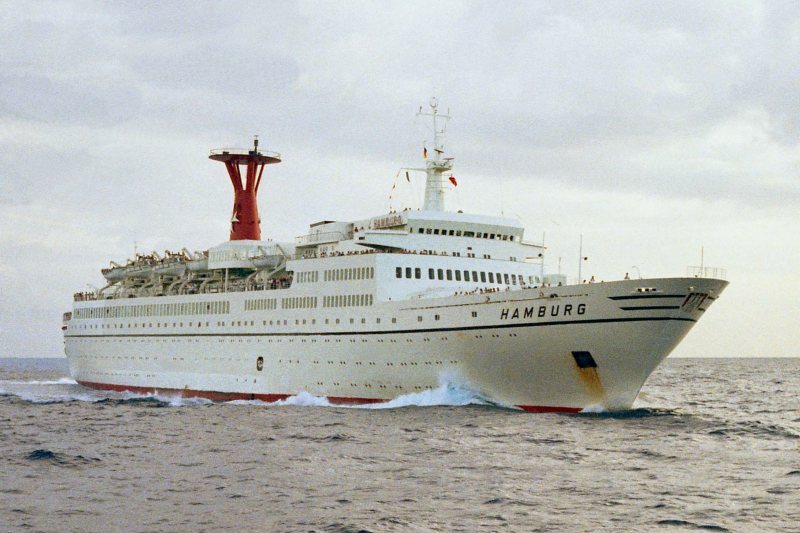 I did go on Hanseatic on one of her last cruises in March of 1973 and always wanted to travel on Hamburg but it was not to be. Great photo. A fabulous shot of this stunning vessel. Tony, she passed us on our port side, we was both going the same direction. I took some other photos also, she came much closer, we could shout to each other. List of the ship and wake seems to indicate she is turning to port to avoid coming any closer. Thanks, Tony. It is taken from a large sailing-vessel, and HAMBURG came very close to greet us. That's why there is so many people on deck there. Arnes, great photograph of this fine ship underway. This photo has been shown 1,613 times since it was added to the site.